This big event will be held on Saturday, 28th February 2009 di Pulau Langkawi, Malaysia. IRONMAN triathlon is the longer version of triathlon. Normal triathlon distance (Olympic distance) which is – 1.5km swim with 42 km bike and lastly 10km run whereas for IRONMAN triathlon distance it is 3.8km swim with 180 km bike and lastly 42km marathon run. So careful with the title. Brunei will be represented by Hj Abu Bakar – self sponsored athlete macam kami jua. 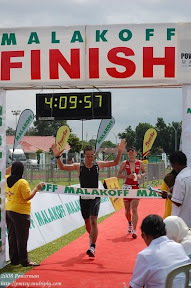 This is his 4th or 5th time competing in IRONMAN Langkawi. The last time was in 2005. Next year, me and Ahmad Fathi are planning to register and compete in this event. For now, I must complete and finished the Brunei triathlon and then try to compete in half IRONMAN either in Malaysia or Singapore.